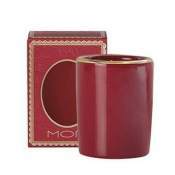 Mor Emporium Black Cherry Plum Fragrant Candle. Elegant black wax and a high fragrance concentration continue Mor's tradition of luxury. Beautifully package for gift-giving for someone special (like yourself!).!). Beautifully packaged - fabulous scent! The MOR candles are unbelievably fragrant. I purchased my first one at Bergdorfs in Manhattan and have been hooked ever since. They are slightly more expensive but worth it. I would highly recommend them to anyone.